The global market for aerial imaging has been witnessing a substantial growth over the past few years, thanks to the increased adoption of advanced drone/unmanned aerial vehicle (UAV) in the defense and various other industries. The growing footprint of aerial imaging solutions across various applications, such as cartography, construction and development, defense and security, and intelligence surveillance, is another important factor, bolstering the growth of this market. The worldwide aerial imaging market stood at US$1.36 bn in 2016 and is anticipated to register a CAGR of 14.6% from 2017 to 2025, reaching a value of US$4.58 bn by the end of 2025. The rising popularity of location-based services and various technological developments in the field of advanced aerial camera systems and drone technology are expected to propel this market substantially over the forthcoming years. Aerial imaging finds a widespread application in energy, natural resources management, geospatial technology, construction and development, defense and intelligence, disaster response management, conservation and research, and media and entertainment. Geospatial technology has been reporting a greater application of aerial imaging. In 2016, it emerged as the leading application area of aerial imaging with a share of 21.5% in terms of revenue contribution. The defense and security sector also has always been a prominent consumer of aerial imagery and geospatial data. The usage of aerial imagery in this sector has now increased significantly due to the high level of awareness among consumers and the availability of high-resolution aerial imagery from numerous suppliers. The construction and development, geospatial technology, and natural resource management are likely to surface as promising applications areas of aerial imaging over the next few years. The global market for aerial imaging boasts of an extensive presence across North America, the Middle East and Africa, Europe, Asia Pacific, and South America. With US$575.9 bn in revenues, North America dominated the overall market in 2016. Thanks to the rise in the agriculture and forestry industry, this regional is likely to remain leading over the years to come. Since aerial photography helps farmers to identify their crops and take decisions regarding whether or not to increase the water supply to the crops, its application in farming has increased, reflecting greatly on the overall market. 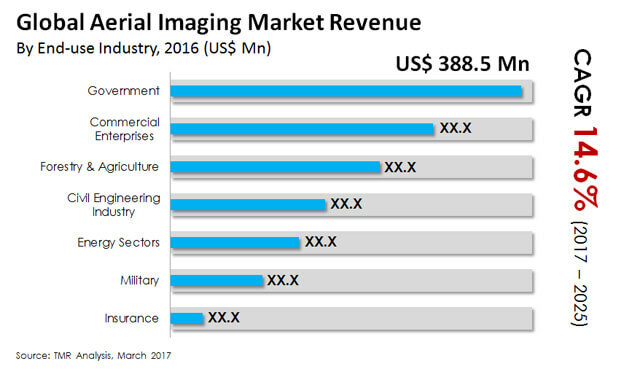 The Europe market for aerial imaging stood second in 2016 and is anticipated to continue in this position in the near future. The growing usage of aerial imagery for monitoring the aquatic vegetation, increasing developments in imagery Intelligence solutions, and the rising number of organizations in Europe involved in collection of aerial photography are stimulating this regional market. The Asia Pacific Aerial Imaging market is being driven by the escalating usage of aerial images for ground water mapping purposes while the increasing application of aerial imagery in the tourism industry is boosting the Middle East and Africa market. The South America market is likely to gain from the steady growth of the agricultural and the industrial sectors in the years to come. NRC Group ASA, Fugro N.V., Digital Aerial Solutions LLC, Nearmap Ltd., Google Inc., EagleView Technologies, Inc., Cooper Aerial Surveys Co., Landiscor Real Estate Mapping, GeoVantage Inc., and Kucera International Inc. are the most prominent players in the global aerial imaging market. The “Aerial Imaging Market [By End-use Industry (Government, Commercial Enterprises, Civil Engineering Industry, Military, Forestry and Agriculture, Energy Sector, Insurance); By Application (Energy, Geospatial Technology, Natural Resources Management, Construction & Development, Disaster Response Management, Defense & Intelligence, Conservation & Research, Media & Entertainment)] – Global Industry Analysis, Size, Share, Growth, Trends and Forecast, 2017 – 2025 “ report provides the analysis of the global aerial imaging market for 2015 – 2025, where in period from 2017 to 2025 is forecast period and 2016 is considered as the base year. The report precisely covers all the major trends and technologies playing a major role in the Aerial Imaging market growth over the forecast period. It also highlights the drivers, restraints and opportunities expected to influence the market growth during the said period. The study provides the holistic perspective on the Aerial Imaging market growth, throughout the above forecast period in terms of revenue (in US$ Mn), across different geographies, which includes Asia Pacific (APAC), South America, North America, Europe, and Middle East & Africa (MEA). The market overview section of the report showcases the market dynamics and trends such as the drivers, restraints, and opportunities that influence the current nature and future status of this market. It also provides an overview about the key market trends given across the five geographical regions.? The report segments the global Aerial Imaging market, on the basis of end-use industry into government, commercial enterprises, civil engineering industry, military, forestry and agriculture, energy sectors and insurance, among others. By application, the market has been classified into energy, geospatial technology, natural resources management, construction and development, disaster response management, defense and intelligence, conservation and research, and media and entertainment. Thus, the report provides in-depth cross segment analysis for the Aerial Imaging market and classifies it into various levels, thereby providing valuable insights on macro as well as micro level. In terms of geography, the global Aerial Imaging market is classified into North America, Europe, Asia Pacific, Middle East & Africa, and South America. The report also provides the competitive landscape for the Aerial Imaging market, thereby listing out all the major players according to their geographic presence, market attractiveness and recent key developments. The competitive landscape section of the report gives an overview about the market share of several key players in the market for the year 2016. The aerial imaging market data estimates are the result of our in-depth secondary research, primary interviews and in-house expert panel reviews. These market estimates have been analyzed by taking into account the impact of different political, social, economic, technological, and legal factors along with the current market dynamics affecting the market growth. Moreover, key takeaways section provided at the end of competitive landscape section would help the operating companies to make the best move in this market. NRC Group ASA, GeoVantage, Inc., Digital Aerial Solutions, LLC, Cooper Aerial Surveys Co., Fugro N.V., Landiscor Real Estate Mapping, Google, Inc., EagleView Technologies, Inc., and Nearmap ltd are some of the few major players operating within the global Aerial Imaging market, which have been profiled in this study. Details such as financials, business strategies, SWOT analysis, and other such strategic information pertaining to these players has been duly provided as part of company profiling.